Corporate Secretary of Fisherman and Friends of the Sea (FFOS) Gary Aboud, centre, and other members of the group view the ruptured oil well at sea off Orange valley Fishing Depot in Carapichaima yesterday morning. The abandoned oil well ruptured 6 days ago. Fishermen and Friends of the Sea (FFOS) has sounded an urgent warning to fishermen and mariners about a “volatile and highly flammable site” located 4.5 nautical miles off Orange Valley/Carapichaima Fishing port. 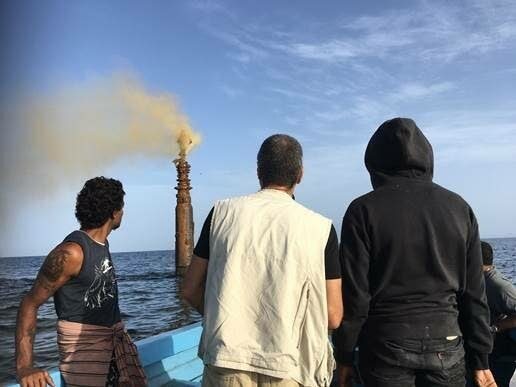 Six days ago, a ruptured oil line began spewing a fiery mix of hydrocarbon mixed with mud into the atmosphere, resulting in a slimy sludge in the waters of the Gulf of Paria. Fishermen from Orange Valley, Carapichaima, and nearby fishing villages have been staying away from the area. Aboud in company with other members of the FFOS visited the site yesterday morning and captured video footage showing what he described as “an extremely dangerous and highly pressurised well rupture spewing a gaseous aromatic hydrocarbon mixed with a muddy substance. He is also demanding answers on whether the Energy Ministry keeps proper records of wells they have taken over. Continuing to demand answers from the Ministry of Energy, Aboud asked whether there were maintenance schedules for abandoned platforms or capped wells. He also asked when was the last time the Ministry of Energy did a safety inspection of the hundreds of abandoned wells in maritime waters and onshore sites. Aboud, a well-known environmentalist, said there were emergency response measures outlined in the National Oil Spill Contingency Plan and questioned why they had not been initiated. He further questioned why the Coast Guard, as first responders to emergencies at sea, had not responded and set up warning signs to alert fishermen and users of the sea. Aboud said vulnerable, voiceless communities of shrimpers and fishermen and those who made a living from the sea were being jeopardised and their families were being pauperised by a recklessly contaminated fishery. Contacted on the situation, head of corporate communications at Petrotrin Gillian Friday said the matter was being handled by the Ministry of Energy and Petrotrin was only asked to supply manpower. Several attempts to get a response from that ministry were unsuccessful. Reply to "FFOS sounds off about oil leak"